This semester I went to two academic conferences that weren’t library conferences. While I’ve attended conferences outside of librarianship in the past, both before I was a librarian as well as more recently, this is the first time in my library career that I’ve intentionally gone to non-library conferences. At both conferences I was making a presentation, which of course was a major factor in my decision to attend. But I highly enjoyed them both, and was pleased to find much of relevance both to my interests in librarianship as well as in higher education and the disciplines. 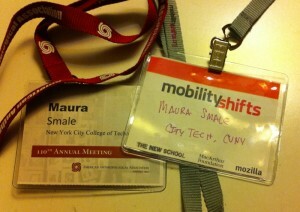 The first conference I attended this semester, the MobilityShifts conference at the New School (about which I wrote a brief wrap-up here on ACRLog), broadly addressed issues in teaching and learning, and specifically focused on mobility and education. This was a busy conference that spanned multiple days, and though it meant for a breakneck schedule I was able to see lots of great sessions. While there were presentations by and for librarians, I was most interested in the sessions that addressed bigger pedagogical questions. In our day to day work it’s easy to think only of the library — after all, that’s the physical and mental space in which we likely spend most of our time. But I found it incredibly valuable to have the opportunity to step back and consider the library as it relates to the whole of the college while I listened to presentations by classroom faculty, researchers, students, and more. I also went to a discipline-specific conference this fall, the American Anthropological Association Annual Meetings, where I was part of a session on library ethnographies. Unfortunately I didn’t have as much time to spend at the AAAs as I had at MobilityShifts, but I was able to catch a few other sessions and had the chance to browse the exhibits, who were mostly scholarly publishers. I work at a college library so I spend much of my time considering student use of the library, and it was interesting to see the ways that researchers embedded in their disciplines consider issues of interest to libraries, like academic publishing, open access, and digital scholarship. In the future I’d like to try to continue to head out to non-library conferences on occasion. Of course, a major factor that impacts our ability to go to conferences in any discipline is cost. As travel budgets are often slashed along with other belt-tightening measures at colleges and universities, it may not be feasible to attend to both library and non-library conferences. But if it is possible, I highly recommend it as a way to keep up with academia beyond reading the higher ed news and blogs. If you’ve gone to academic conferences outside of librarianship, what are some of the benefits you’ve found? Would you ever substitute a non-library conference for one that caters solely to our profession? Just exactly what role do we play in higher education? Where do we fit into the structure of colleges and universities? On a day-to-day basis I suspect that most of us don’t think about this question. We identify ourselves within the structure of our own academic library organizations: cataloger; reference librarian; bibliographer. Our identification may also be shaped institutionally: professional staff; administrator; faculty. But when we attempt to identify ourselves on the industry level, where we sit becomes less concrete. Identify is important to our sense of self-worth and self-esteem. When our identify is called into question, we may feel threatened or less secure about our standing in the organization. While in our library organizations we have a fairly specific identity, within the grander scheme of higher education academic librarians – no matter what their position or title – tend to get grouped into one of two categories: administrator or support staff. Most academic librarians working elsewhere than the administrative office do not think of themselves as administrators. You teach a few dozen instruction sessions a year, and that makes you an instructor – not an administrator. You say you have faculty status and that makes you a faculty member – not an administrator. When you work at the reference desk you help students with their assignments which is another way of helping them learn – definitely not administrator territory. I agree with you. Front line librarians spend considerable time on non-administrative matters that would be identified as “teaching” or “instruction”, whether it happens in a classroom, at the answer desk or in a hallway. But when national data about higher education are collected and reported, we tend to be grouped in with administrators or support staff – not instruction staff. Consider the July 2010 report from the Delta Project,a non-profit organization that studies college costs and accountability issues, . In examing trends in college spending between 1998 and 2008, there are data in the report worth reviewing. One of the findings that received the most attention in the popular press was the growth of funding for student services. One expert, Richard Vedder, in his reaction to the data referred to it as the “country clubization” of higher education – too much money is being spent on amenities to attract students while instruction suffers. But when one examines the data it’s clear that while spending for student services has accelerated in the past few years, the vast majority of college expenditures go to instruction – for which spending has remained fairly static. Academic support: Activities that support instruction, research, and public service,including: libraries, academic computing, museums, central academic administration (deanâ€™s offices), and central personnel for curriculum and course development. In 1976, for every 1,000 full-time students, there were 42 professional administrative staff members, according to the National Center for Education Statistics. By 2008, the most recent year available, there were 84. At the same time, the number of full-time faculty members for every 1,000 students has declined, from 65 to 55, due to the greater use of adjuncts and teaching assistants.While fewer undergraduates are being taught by full-time professors, the number of administrators keeps growing. They also point to questionable administration positions they’ve identified in their research: vice president for student success, residential communications coordinator, credential specialist, dietetic internship director, director of active and collaborative engagement, and coordinator of learning immersion experiences. They’re not saying these folks have no purpose, but they question whether the positions are truly fundamental to the mission of higher education or are simply evidence of out-of-control administrative hiring. What might they say about academic library positions such as “director of scholarly communications” or “coordinator of assessment”? Do academic libraries contribute to the administrative bloat in higher education? Whether academic librarians are administrators or instructors is perhaps not as important as how we demonstrate that we are fundamental to the core mission of our institutions – to educate the students and promote research and discovery that benefits society. With the exception of perhaps a few well-resourced institutions, I believe it is difficult to make a case that academic libraries contribute to administrative bloat. We certainly have our share of assistant deans and department heads, less so in college and small university libraries, but even many of these individuals are doing practical work that enables the library to serve its mission of supporting teaching, learning and research, along with programs and events that contribute to the cultural and intellectual heritage of our institutions. Front line librarians and other staff may view what happens in the administrative office differently, and any new hire of an administrator rather than a practitioner may be perceived as administrative bloat. The bottom line as I see it is that academic librarians do little to contribute to the administrative bloat described by Hacker and Dreifus, but rather are victimized by it because when our institutions add more vice-presidents, program coordinators and just about anything that isn’t instruction or in direct support of instruction, it drains resources away from academic libraries and hampers our ability to perform our mission. So what do Hacker and Dreifus have to say about academic libraries in their book? Actually, nothing. I read the book and there are no substantive references to academic libraries. In a way, given the overall tone of the book, I suppose that’s a good thing. But it might have been helpful for the authors to have visited and studied some of our academic libraries (they visited many of our institutions in researching the book). What they could have learned and what they might have said about all the things academic librarians do to contribute to student academic success, may have shed some additional light on our role in the academy and the resolution of the identity conflict.